Here in the village of Alfred, New York, many of us subscribe to our community newspaper, the Alfred Sun. And some us have discovered that the Alfred Sun, accompanied by a few well-placed squirts of Windex, can make short work of washing windows. The Sun is compact, maneuverable, and eco-friendly. Two full pages will suffice to wash a standard casement window. You can wash as many as three with a single issue. A few weeks ago, I was engaged in that very task, but the work was not going well. Although I’d liberally applied the Windex and energetically rubbed it off, thick streaks remained. Repeated efforts produced the same result. Newsprint is effective for cleaning glass, I recalled, because the oil in printer’s ink repels the dirty water. Could someone have quietly switched inks? Should I try the Times Literary Supplement instead? Moments later, I took a look at the bottle in my hand. In my haste I had grabbed the Simple Green All-Purpose Cleaner rather than the Windex. Whatever its virtues as a cleaning agent, Simple Green leaves streaks on glass. In my effort to promote clear seeing, I had not seen clearly at all. Perhaps I needed to slow down—and to clean my glasses as well as our windows. Through the regular practice of meditation, we can become acutely aware of the hindrances, even as they are arising, and we can also cultivate our capacity for clear seeing. Merely by sitting still and following our breathing, we can permit the hindrances to dissipate and our minds to become open, spacious, and unperturbed. We can allow realities to emerge, just as they are, and thoughts to clarify themselves, whether the object of contemplation be a lost set of car keys or a sudden rush of anger. The process has been compared to setting a jar of muddy water on a shelf. The mud and other impurities settle to the bottom. The water becomes still and clear. To be sure, this practice may not work for everyone. Newcomers in particular may encounter more confusion than clarity when they first look inward. As Pema Chodron acknowledges, the quality of steadfastness, which may take years to develop, is a prerequisite for clear seeing, especially if what we are seeing is our own narrowness, guilt, or regret. But as the Buddha himself is reported to have said, most of our perceptions are erroneous, and erroneous perceptions cause suffering. That is reason enough to take up the practice, and reason enough to continue. * Pema Chodron, “5 Reasons to Meditate,” Shambhala Sun, September 2013, 54. * See Gil Fronsdal, “Hindrances to Clear Seeing,” Insight Meditation Center. 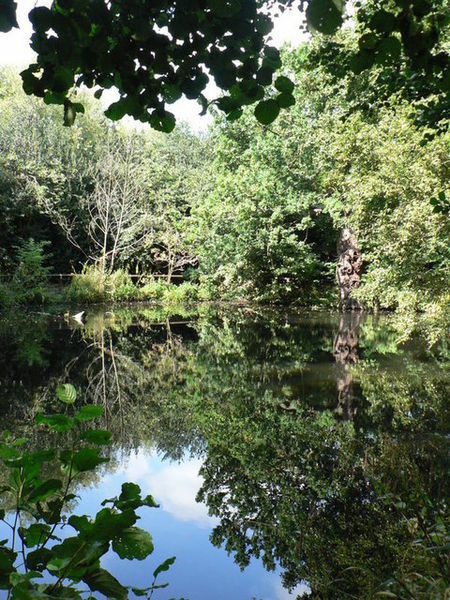 Photo “Bexley: Pond at Danson Park.” Chris Downer.